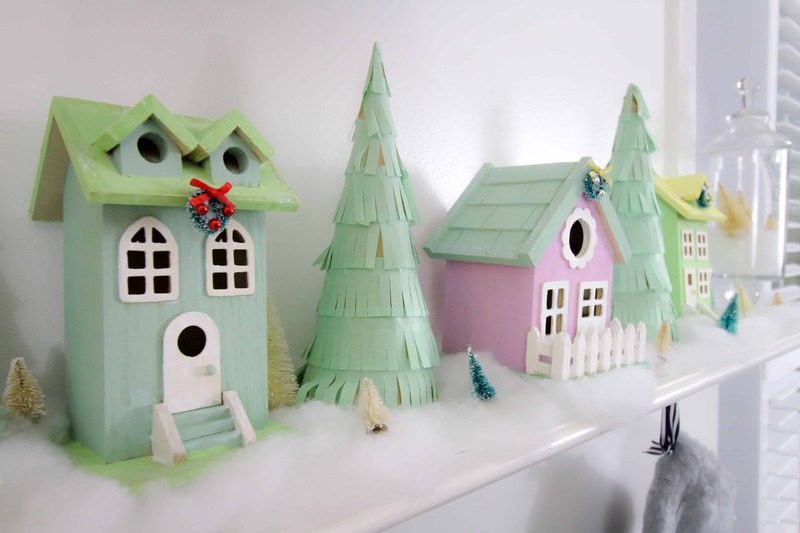 Love the look of this sweet little DIY Christmas Village? You’ll also love how simple it is to make! I have been rocking the same holiday decor for several years now. Sure, I add a few new things each year, but I still keep the same vibe. It’s a good vibe – check out our 2017 Christmas decor here. But, I wanted to mix it up a bit this year. 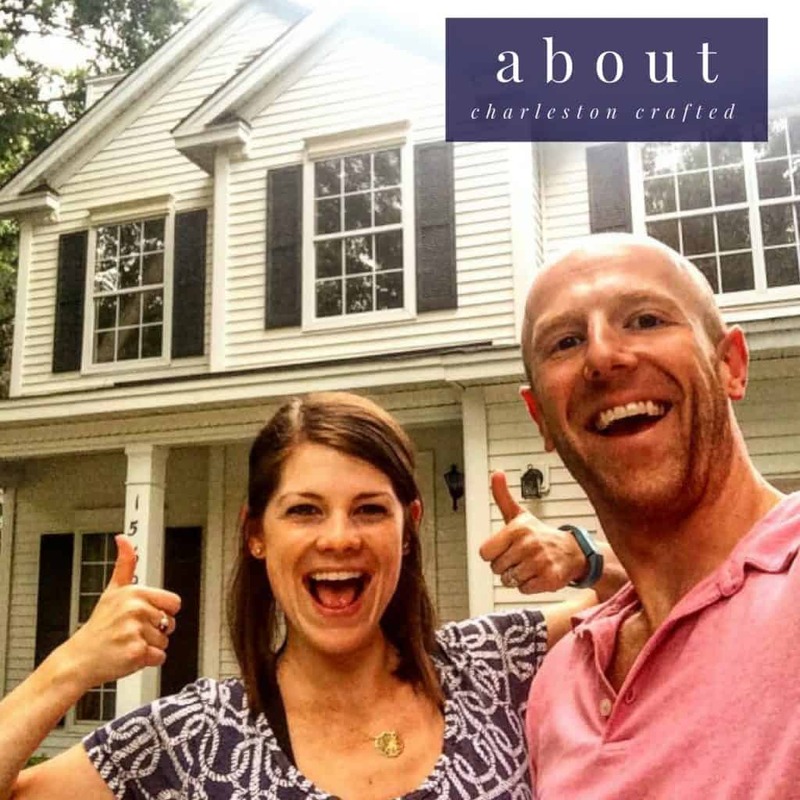 I am by no means tossing out our old decor, but I did make the conscious decision to bring in pastel colors and lots of little houses.I am going for a bit of a rainbow row vibe! 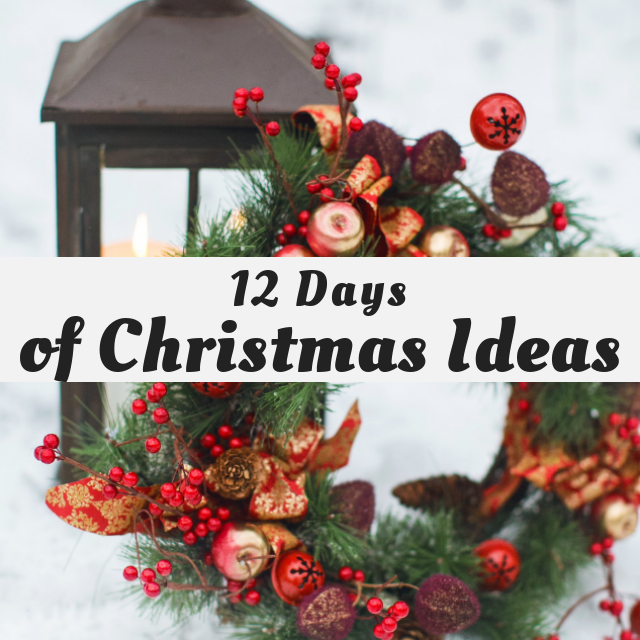 Be sure to check out my bottle brush tree + wooden house wreath tutorial. After I shared that wreath, I had a friend message me that it reminded her of Studio DIY’s Christmas village. 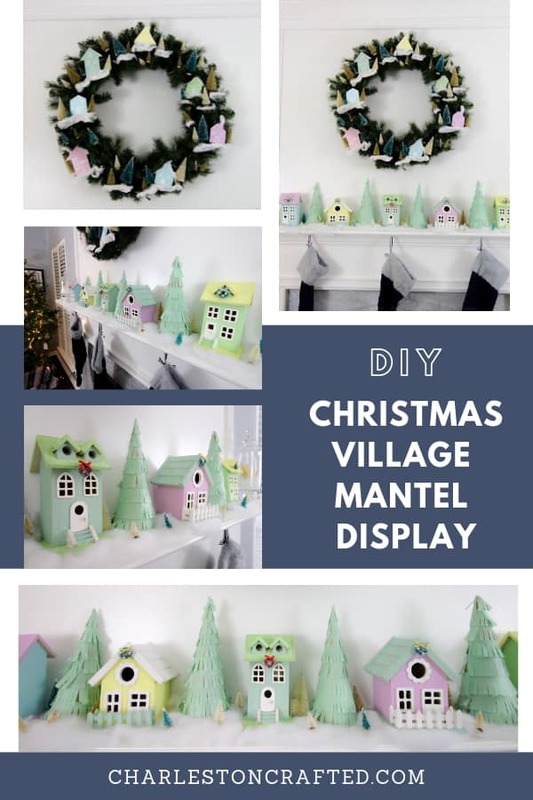 I was planning to build some more scrap wood houses for the mantel, but Kelly’s Christmas village actually was much easier and cuter than what I envisioned. All of these wooden houses are from Michaels. They were about $7 each – be sure to hit up their coupons! They are actually bird houses and they had a huge selection. I also made some simple tissue paper tassel trees to accessorize the look. I love how it turned out! Use craft paint to paint the wooden houses. I recommend no more than 3 colors per house. Once dry, add white glue to the edges of the roof. Sprinkle with glitter. 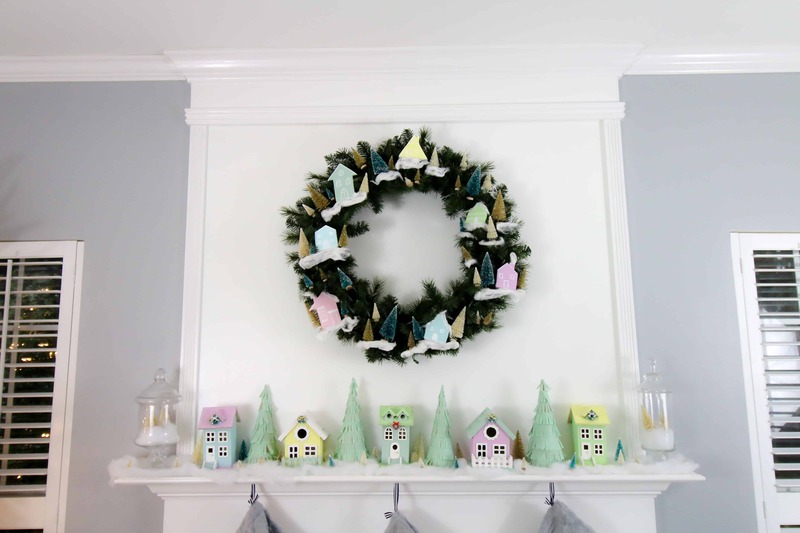 Once dry, use hot glue to attach a mini wreath to each house. Stack several sheets of tissue paper. Fold in half and cut so you have a strip about 2 inches wide (plus the fold – so 4 inches total). Cut up from the non-folded edge to create a fringe. Wrap around the cone to determine the right length. Trim. Use glue stick to attach to the cone. Repeat in layers moving up the cone. These are so adorable. What fun you must have had decorating them. 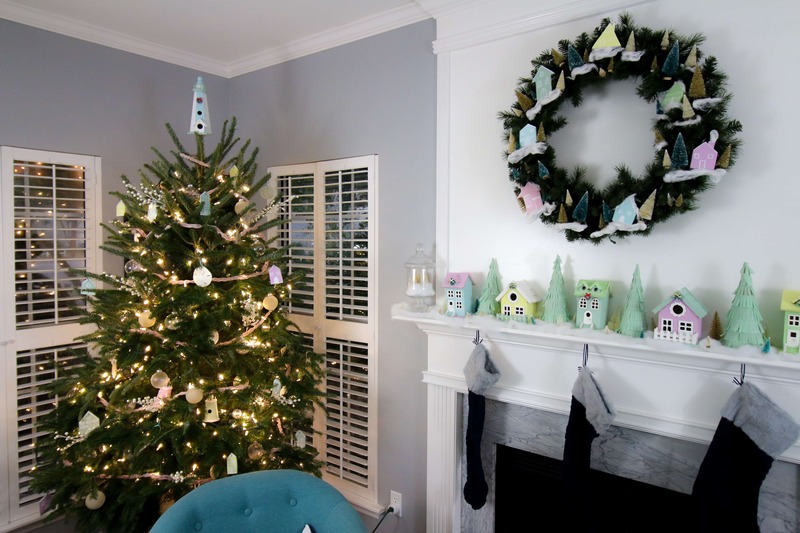 I love those soft, dreamy pastels for Christmas! Gorgeous! Love the pastel vibe. It feels really fresh and fun. Your tutorial is great! I love that village on your mantel with each of them painted a different pastel color.